Afa supplement helps stimulate the immune system. Rich in B group vitamins. Behind the abbreviation AFA lies a widely-studied form of microalgae: Aphanizomenon flos-aquae. Also known as Klamath blue-green algae, this seaweed-like plant is often described as a ‘miracle-algae’ or ‘superfood’ because of its remarkable nutrient content and multiple health virtues. In particular, researchers believe it can improve mood, condition, well-being and immunity. Along with quality proteins and lipids, AFA algae contains numerous micronutrients, including over a dozen different vitamins: vitamin A in the form of beta-carotene, several B group vitamins, and vitamins C, E and K. It also contains minerals such as calcium, iron and magnesium. Klamath algae also owes its ‘superfood’ status to its high content of antioxidants which combat the harmful effects of oxidative stress. Beyond its composition in vitamins, minerals, proteins, lipids and antioxidants, AFA microalgae is also valued for its content in phenylethylamine or PEA. This is a neuroamine or neurohormone which means it plays a regulatory role in the nervous system. Widely-studied, PEA is primarily known for influencing reactions in the body associated with pleasure and intense happiness. Klamath algae’s PEA content has resulted in significant interest among the scientific community. The algae has been studied for its potential to combat mood problems and depression. AFA supplement benefits thus include increasing levels of PEA which are often low in those suffering from depression. 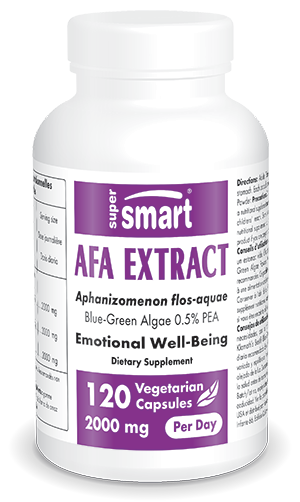 With its exceptional nutritional composition, AFA microalgae offers benefits for general well-being. In particular, it can be used for stimulating the immune system and thus boosting the body’s defences. It also appears to have a beneficial effect on mental performance. The many benefits of Klamath algae are now available as a nutritional supplement in capsule form. These are produced from powdered AFA algae obtained from Klamath Lake in America, which is famous for its clean, pure water. Each capsule contains 500mg of extract, providing 2.5mg of PEA per dose. Depending on your needs and the advice of your therapist, the dosage of this supplement can vary from two to four capsules a day, to be taken on an empty stomach. Other ‘super-algae’ are also available such as spirulina, knotted wrack and chlorella. Other ingredients: Microcrystalline celullose, magnesium stearate, silicion dioxide. Adults. Take two or four capsules as required in the morning on an empty stomach. Each vegetarian capsule contains 500 mg of Klamath's Best® Blue Green Algae Powder.